bushretires brauchte ein neues Website Design und hat einen Wettbewerb auf 99designs gestartet. 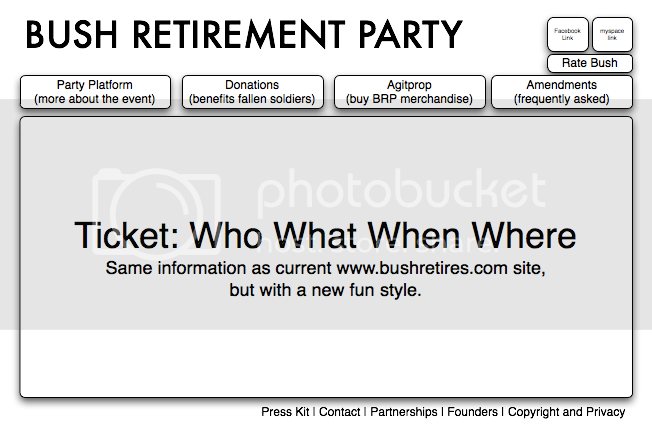 Fun, light-hearted website design for a charity concert and party called "Bush Retirement Party" in Austin, TX. The end of an error. | The party the whole world's been waiting for. Very creative website design/layout needed to attract young party-goers to an Austin charity event. The desired mood is celebratory, as it will be commemorating George Bushâ€™s final Saturday in office. * The party the whole world's been waiting for. * The end of an error. Anti-Bush, but not bitter is the goal. Entries should leverage the current logo, but feel free to take liberties on any modifications to enliven the spirit/mood and build consistent with overall site feel. Please do not feel the need to adhere strictly to the layout of the navigation outline image. It was only provided as a reference regarding the links and content.